Year: First produced in 1999, but since then Texas Instruments produced TI-30XII in many colors! Pictured is the blue TI-30XII I bought from Target in 2012. Fun fact: Blue is my favorite color. Price: $10 - $20. Prices tend to be lower at Target, WalMart, Amazon, and major stores, towards the higher end at pharmacies and stationary stores. Price can be much lower if you get it at swap meets. My particular one has the production code K-0312N (March 2012). There is a battery operated version, the Ti-30XII B. Given a choice, I’d pick the solar version. The TI-30XII is a basic scientific calculator. The display has two lines. The top line is the expression line, and the bottom line stores the result. The top line also serves as menu choices and prompts. What is impressive about the display is how the digits and display are in large, clear font. * 1 and 2 variable statistics. Enter statistics mode by pressing [2nd] [DATA] (STAT) and choosing between 1-Var and 2-Var. 2-Var mode allows for Linear Regression analysis (ax + b). If you need help with operating the TI-30XIIS, there is plenty of online tutorials available. 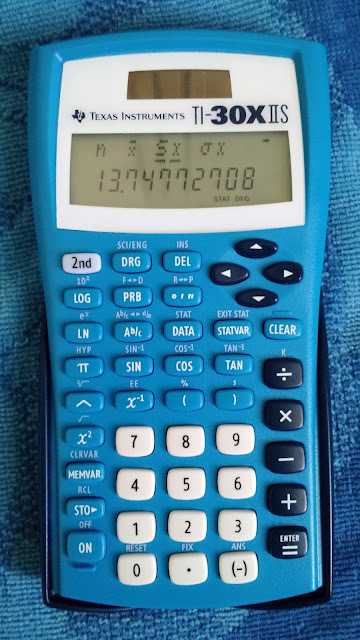 I would recommend the TI-30XIIS if you like a basic scientific calculator where you are able to see the expression that you entering. This calculator is good for quick calculations and having an inexpensive calculator.